Barbets/Griffons and Shepherds are closely related is a fact. Difficult to go back in time, however when reading documents and comparing photos, there are several ressemblances, on phenotype. M Hermans at one time did agree with the origins as written in the documented below. Nouba was 1 in this photo and closely ressembles the Barbet de Camargue/ Crau (line 2) and as you will notice, the Berger de Brie. There are only a few left of this Barbet bloodline today and their genetic value is...invaluable! 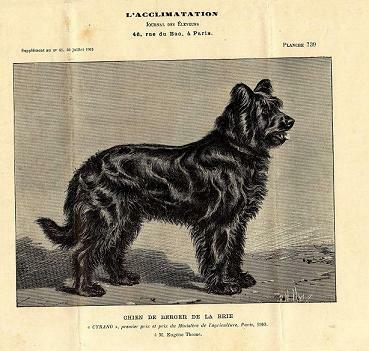 Many breeds in France and elsewhere suffered the ravages of WWII, and long after WWII, registered "Titre Initial" dogs. 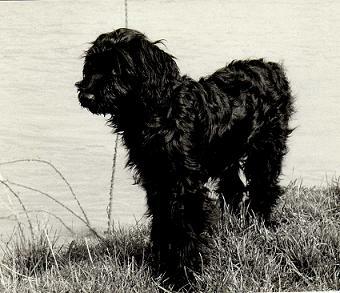 It was no exception in the Barbet, which had been a small breed of what had been produced before the war.. Lines were rebuilt as dogs that corresponded to the standard and old photos and breeders' knowledge were mated and of course different breeds were mixed. What has never come out from "old Barbet bloodlines" however, is a Poodle.